Ranked from 24 ratings. Score is adjusted from raw score by the median number of ratings per game in the jam. I love this - the keybinds seem completely insane at first, but they work. This could be really fun on ipad or something. Totally bonkers -- it has a great constant fun mechanic; the player gets to control how much fun they're having at every moment because they can execute a trick anytime, and how complex it is is up to them. 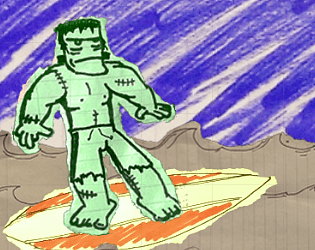 Excellent surfin' game, crazy stuff! I love how you seemingly need to use your feet along with your hands to play it. And the graphics style, ruled paper art, looks awesome! Probably most crazy game in pdjam in my opinion :D Simple graphics style isn't bad, music gives game a huge part of crazy mood, and plus is a large amount of obstacles. ;) Very nice! This was a LOT of fun. Responsiveness on controls was pretty tight, loved the feedback on all the moves, and the integration of theme with the highschool sketch style of art is FANTASTIC. A+, would monstrous handstand kick frontflip again. The game should be playable with only 8 fingers; if you need more, borrow some from a friend. This game is totally rad, but I must ask, why must I need to have 29 fingers to be able to play this game easily? This had just the right amount of crazy for me! I think I broke a couple of fingers while trying to do the tricks... Totally worth it. Why is there no humor category?! Well it still gets a good score for fun.